Artwork gives your home a personal touch while adding vibrancy and inspiration to your place. But how do you make it all look good on the wall? First of all, make sure that your artwork has the right proportions for the area you wish to hang it. Use a couple of post-it notes and stick them onto the wall outlining the dimensions of the artwork. When the proportions look right for you, go for it. If you find the picture too small, put it in a frame that has a large mat or consider grouping a couple of pictures together to give it more oomph. Most people tend to hang the picture too high craning their neck when they wish to view the newest addition to their artwork collection. Don’t make the same mistake. Hang the middle of the picture around 150cm off the floor which represents the average eye-height of us humans. This makes it comfortable to enjoy those fabulous pieces of art. If you stick to this standard throughout, you create a harmony among all pictures in your home. They will all share a midline as you look around, irrespective of the different outside dimensions they might have. Because the hanging height of your art pieces is so crucial, I have put simple steps together for you to follow and never get this wrong again. Arm yourself with a hammer, picture hanging hook, tape measure and a pencil and start. Measure the height of your frame (Example: 60 cm) and divide in half (=30 cm). Measure the distance between the wire at full tension and the top of the frame. Example: 4cm. Subtract those 4 cm (or whatever it is in your case) from the 30cm half height. This results is 26cm in our case. Add 150cm (our average eye height) which brings us to 176cm. Measure 176cm off the floor and lightly mark this on the wall. Place your picture-hanging hook here. Done! Do you need to relate artwork to the furniture below it? Absolutely! As a rule of thumb, leave between 12cm to 25cm of space between the top of the furniture piece and the bottom of the frame for hanging art over a sofa, console, chest of drawers or headboard. Make sure the picture is no longer than the furniture itself. It usually looks the best when the artwork is about three-quarters of the width of the furniture. When working with a group of images on a wall, think of the grouping as one large picture, meaning the middle of the composition to be placed at eye height. Cut paper templates to size for each piece of art and attach the paper cut-outs to the wall with Blu-Tack or painter’s tape. Start from the centre and use a spacing of 2cm to 8cm between pictures depending on the size of the pieces. The smaller the images, the less spacing is necessary and vice versa. Now stand back and see how the artwork’s size relates to your room and furniture. Move the templates around until you are entirely happy. Yes, this means serious effort hanging up your grouped pictures but the final result is worth it. Enjoy your artwork that adds so much personality to your home. 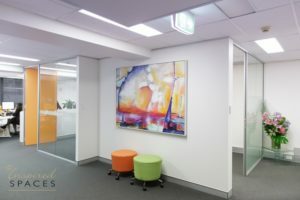 If you are uncertain on how to place your artwork with impact and balance, please contact the team from Inspired Spaces.